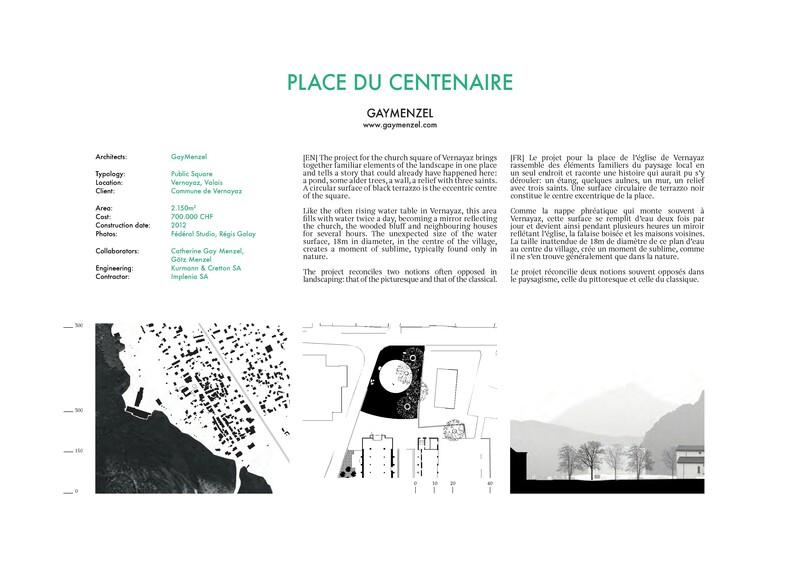 The project for the church square of Vernayaz brings together familiar elements of the landscape in one place and tells a story that could already have happened here: a pond, some alder trees, a wall, a relief with three saints. A circular surface of black terrazzo is the eccentric centre of the square. Like the often rising water table in Vernayaz, this area fills with water twice a day, becoming a mirror reflecting the church, the wooded bluff and neighbouring houses for several hours. The unexpected size of the water surface, 18m in diameter, in the centre of the village, creates a moment of sublime, typically found only in nature. The project reconciles two notions often opposed in landscaping: that of the picturesque and that of the classical.